Why Buy Hutchco Easel Back Sign Holder Displays? Clear plastic sign holder displays will not not scratch, chip, break or turn cloudy over time. Easy to use cardboard easel back wings fold flat, and collapse, for storage and shipping. Plastic sign holders are true to size, and if you need a custom size —just ask! Eco-friendly easel boards are made from 100% recycled paperboard, 100% made in USA. Eco-friendly vinyl cover sleeve is more biodegradable than acrylic. Plastic sign holders are shatterproof and more durable than fragile acrylic sign holders. Easel back sign holder will cost much less than an acrylic sign holder of the same size. Every Easel Back Sign Holder comes with an attached cardboard easel, which folds flat for shipping, and a clear print protector cover sleeve, which is shatterproof, scratch proof, and low glare plastic vinyl. These stackable and portable signage holders from Hutchco are always priced 50% less than comparable acrylic sign holders—and ours will never break. Order the size and quantity you need and watch your tabletop displays draw attention to your brand. Hutchco is proud to be the manufacturer of products designed to make your branding messages shine brighter in clear low glare tabletop sign holders. Ask us for a sample today, and you will discover that these really are the best countertop – desktop – tabletop POP display sign holders for all your indoor marketing, advertising, and event signage! Each countertop display sign holder includes a removable clear plastic display cover, and cardboard easel attached on the back that folds out for support. These popular folding Easel Back Sign Holders are designed to hold your paper print between the crystal-clear plastic display cover (that easily slides on and off) and the sturdy easel board which is 70 pt. thick (competitors use only 50 pt.). Designed to hold and display print collateral of any size large or small, including printed signs, print flyers, and posters. All of our plastic covered cardboard counter card displays will fold flat for easy packing, shipping and storage. You can slide them into your travel kit or ask us to send your displays direct to the tradeshow office or retail showroom. Reusable and shatterproof, Hutchco POP Displays are designed for retail events, vendor booths, and in-store counter displays. With 30 sizes of sign holders at low low prices, we offer you a greater advertising advantage across more counter tops. 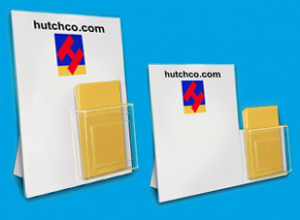 Contact Hutchco to order a sample of our affordable, eco-friendly, unbreakable, and light-weight POP counter card displays. Watch a demo on HutchcoVideo showing how to set up your easel back sign holder displays. Does your business use a wide variety of print sizes for its marketing materials? 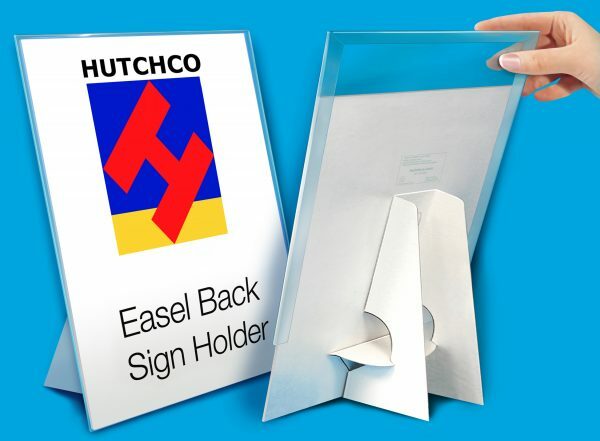 Hutchco’s plastic covered cardboard easel sign holders come in 30 different size and orientation combinations. You’ll find them from 4 x 5-inches through poster-sized 18 x 24-inch displays. With all of those combinations, you will find plastic signage displays for all of your print materials, to display on any available counter top space, large or small. If you do not see the size you are looking for just ask! We make all products in-house and will be glad to produce a quote for making your custom size. 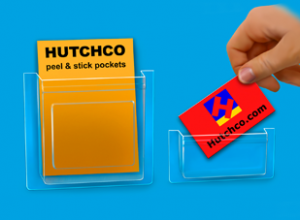 Create an instant literature holder display when you add-on a Hutchco Peel and Stick Brochure Pocket to your easel back sign holders. We help you display more of your business information even in limited spaces —at the checkout counter, near point-of-purchase displays, and on tabletops, or near products for sale in your retail showroom. Customers will be within easy reach of brochures, rack cards, business cards and coupons when you display our Sign Holders with a Brochure Holder. These durable plastic brochure holders are sold in seven sizes, from small pockets designed for holding business cards —to literature holders as large as 8.5” wide for displaying pamphlets, booklets and flyers. We also offer the convenient Easel Back Sign Holder/Peel & Stick Pocket combinations for sale. The combo packages of Hutchco Easel Back Signholders with Brochure Pocket are sold in two Sign Holder sizes: 8.5″ x 11″ and 11″ x 14″, with one 4″ Peel and Stick Brochure pocket included with each easel sign. Start saving money today on all your cardboard and plastic counter top marketing POP display signs.